The Big Brother Naija season 2 housemates were all taken left speechless following Bambam;s surprise eviction but Teddy A was the one left shattered. We could go back as far as our memories allow us to and even then, it would be utterly difficult to find moments where Teddy A and Bambam weren’t joined at the hip. Their relationship and games were so directly aligned that it wouldn’t be completely careless to assume that this was exactly their strategy. So supposing it was, Teddy A has certainly lost a vital part of his focal point and only the time keeper can tell us how it will play out for him going forward. Besides the fact that his affection towards Bambam was obvious, he wasn’t exactly the initiator, well at least not often enough because it was clear that Bambam wore hers on her sleeves and riskily bore it all. Having always been open and vocal about his relationship outside the Big Brother house and how he and Bambam just had a ‘special’ friendship, one would expect some level of disappointment given the circumstances under which Bambam had to let go of her 45 Million Naira dream. However, his reaction was way more than just disappointment. 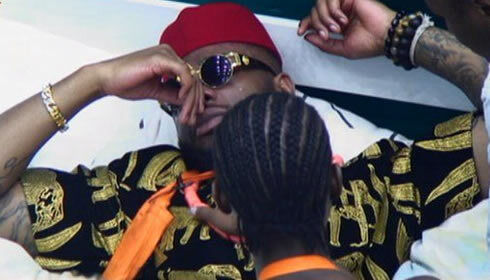 When Ebuka unsealed the envelope and announced Bambam as the unfortunate Evictee, it took a bit of time for Teddy A to react but when he did, it was a sad sight, his first official display of emotion. Although shock replaced the post-party excitement and left the housemates lubricated on a slippery surface, Teddy A was the one left groundless when he realised that Nina and Cee-C were in fact stronger competition than Bambam was. There’s only a certain amount of disappointment a person can handle and judging by his teary episode, Teddy A had reached his threshold and just couldn’t contain it. Seeing as he’s never had a ‘sore loser’ attitude when he couldn’t quite crack the Challenges Biggie lay before them, losing Bambam seems to be the only loss that mattered to him. That’s what happens when you spend a total of 62 days with someone, and in Bambam’s own words “fall stupidly for them”, only to have them taken away from you. It might be hard to fathom this especially when one’s faves are at the receiving end of such sour eventualities but as mentioned before, the Big Brother concept strives on twists and plots that bring discomfort to both the Housemates and viewers alike. Teddy A’s game seems to have reached its peak but that doesn’t make an incline impossible.